Complete both sides of the form by answering the questions. All questions are optional. Consider placing a recent picture of yourself in the plastic sleeve.You may also consider placing a copy of your DNR (Do Not Resusciatate) and/or Living Will in a separate envelope and taping it to the refrigerator. Place the magnetic envelope with the completed Vial of LIFE Form on the outside of your refrigerator. Place it at eye level so that first responders can easily find your complete medical information. 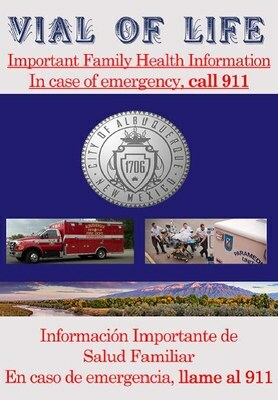 If you have any questions call the Department of Senior Affairs at (505)764-6400 or ask your Care Coordinator.